Coming to the table this morning. Beginning this day in conversation. Saying again – I believe there is more beyond my circumstance and ability, and I need help. My circumstance has disappointed, and my ability has failed. And for those days when circumstance is “rolling,” and abilities seems to be working to my advantage, I still must grapple with the reality that this could change in an instant. My Father has told me it is in my best interest, and most importantly he has told me he desires the time. So, I made the decision to first come to the table, and I opened myself up to the need for a conversation. But what should we talk about? I had no idea. I went to a friend for some help. 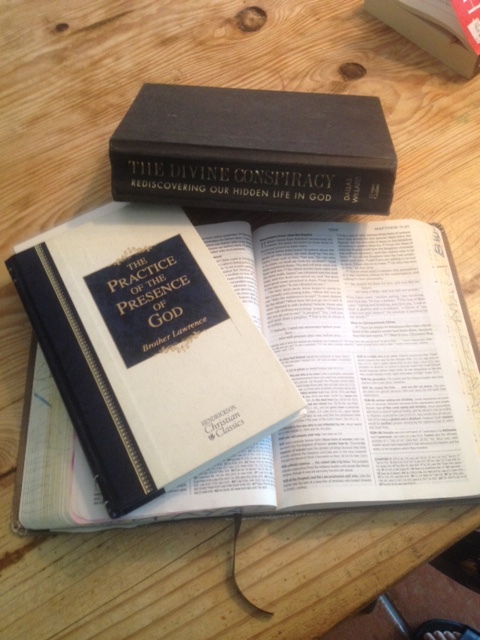 I pulled Brother Lawrence (The Practice of the Presence of God) from my bookshelf and began thumbing through the pages reading my marks from previous reads. This word got my attention – blindness. And so the conversation begins . . . .
11 verses on the subject – I read through each phrase, and here are the 2 that got my attention – Isaiah 40:5 and Matthew 5:8. At least, that is as far as I roamed today. Hmmm . . . . So, if I am asking for sight, in one verse, everybody is getting it, and in the second only the “pure in heart.” Problematic. Which is it? What do I need to do to get this sight? My initial thoughts are this: “pure in heart” is a core issue of motive and thinking. Less to do with action but what my action shows from the inner workings of mind and heart. As I am someone suffering from “excellent flesh” syndrome, I get that. My battles mainly show up between the ears. So, to focus on the inner workings is always a good reminder. What is going on in my thoughts? What lie am I embracing? What judgement am I passing? What pity am I accepting? But there was more in the conversation this morning. So grateful – along with “excellent flesh” syndrome, I also suffer from “living for God instead of from God” syndrome. Both verses had more to say to me! Isaiah 40 is a rich chapter heralding the coming of the Messiah in our midst and promising comfort to the Israelites while in exile in Babylon. In a few verses above Isaiah 40:5, God also says to Isaiah to speak to “my” people. Then, he tells him how to speak by using the adverb “tenderly.” I am sucker for all things parts of speech. It is the English teacher in me, and I take notice. First of all, he adds an adverb to tell me more about the verb. Second, he chooses the adverb “tenderly.” I am grateful for what this tells me about Father. He is a God that is speaking, and his speech to me, like the Israelites, a wild and rebellious child, is tender. Then in a few verses, in his decision, he will choose to reveal to me his glory, and I will see! Grateful is my response. I don’t understand it all entirely, but I do understand the parts of speech. I do understand his movement and initiative towards me even in my lack of performance to earn this attention. So, if that is the case, why in the world does he move in Matthew 5 to telling me I have to do something in order to get sight? If I am “pure in heart,” then I will see. Has he changed his mind? I need another friend, and I remember Dallas Willard wrote a whole chapter on Matthew 5 in his book The Divine Conspiracy (see chapter 4). Willard goes on to clarify his take on this exact verse, and get ready, it was not what I was expecting. For those of you suffering with my same syndromes, it hit me right between the eyes, and it was absolutely freeing! I had it wrong. The focus in Matthew is not on my doing. If I can just get this “thought pattern” thing right, God will give me sight. I know this may be hard to get your mind around, but Willard offers quite a paradigm shift on these verses. Grateful for the “coming and the beginning” of the morning. Grateful for the treasure of this word for my day. For me, I begin again today in the power of the relationship not the anecdote for sight. I receive the second as I focus on the first.